Subject:Describes the use of Oregon Sitka Spruce in the construction of aircraft during World War l.
Aircraft proved their military worth during World War I — initially for observation purposes, and later for the support of ground troops and bombing. When the United States entered the war in 1917, air supremacy was hotly contested and airplane production was vital to the war effort. Early airplanes were constructed of linen stretched over a wood framework. Because of its light weight, flexibility and strength, Sitka spruce was the wood of choice. Sitka spruce, thrives in the ‘fog belt’ of the Pacific Coast from Northern California to Kodiak, Alaska. Only Oregon and Washington, however, provided trees of sufficient size and abundance for the production of aero-lumber. During the 1900s, the average spruce tree in this region exceeded 4 feet in diameter and 160 feet in height. Within the first six months of the war, the Spruce Production Division was organized, under the command of Brig. Gen. B. P. Disque, to increase lumber production. Gen. Disque recruited 27,661 enlisted men and 1,222 officers from the U.S. Army, and after brief muster at Ft. Vancouver, Washington, ‘spruce soldiers’ joined civilians to work for private companies in logging camps and sawmills. In 1918, the Sitka Spruce Company operated a sawmill at this site with soldiers of the 103rd Spruce Squadron. Fifty-two enlisted men and two officers occupied a two-story barracks on these ground and worked around the clock to fill a government order for 1,000,000 board-feet of aero-lumber. 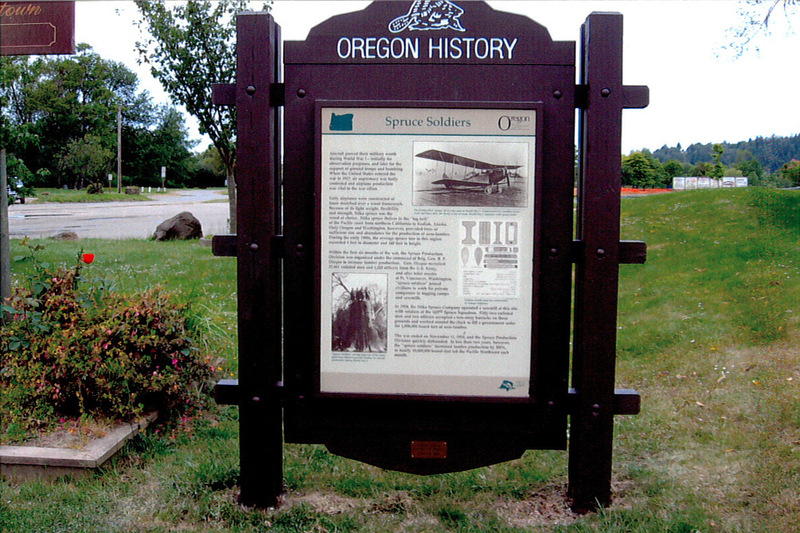 The war ended in November 11, 1918, and the Spruce Production Division quickly disbanded. In less than two years however, the ‘spruce soldiers’ increased lumber production by 300% as nearly 10,000,000 board-feet left the Pacific Northwest each month.